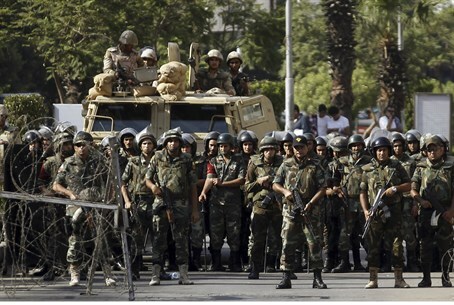 Egypt's military launches airstrikes and ground operations on Sinai jihadists, killing 63. Egypt's military on Sunday launched airstrikes and ground operations that killed 63 Islamists in North Sinai, security sources said, according to the Reuters news agency. The Sinai has recently witnessed some of the heaviest fighting between security forces and Islamists since the army ousted President Mohammed Morsi of the Muslim Brotherhood in 2013. Security sources said on Sunday that troops killed the 63 in villages between the towns of Sheikh Zuweid and Rafah, Reuters reported. The army found four hideouts and attacked them with Apache helicopters and ground troops. It also attacked vehicles belonging to the militants, the security sources added. Islamic State's Egypt affiliate, recently renamed Sinai Province, has killed hundreds of soldiers and police since Morsi’s removal. Though the vast peninsula has long been a security headache for Egypt and its neighbors, the removal of Morsi brought new violence that has grown into an Islamist insurgency that has spread out of the region. Just last week, the Islamists carried out a multi-pronged attack in which some 50 Egyptian soldiers were killed. Egyptian government officials have accused Morsi's Muslim Brotherhood of links to Sinai attacks. The Brotherhood says it is a peaceful movement that wants to reverse what it calls a military coup through street protests. Egypt's interior ministry said on Sunday it had arrested 12 Brotherhood members who had formed three cells with the intention of carrying out attacks on policemen, soldiers and military and police bases, according to Reuters. Also on Sunday, the prosecutors referred to trial 22 people charged with planting bombs near targets including the high court and cabinet buildings, state news agency MENA reported. On Saturday, Egyptian President Abdel-Fattah Al-Sisi said that Egypt had foiled an attempt by the Islamic State (ISIS) group to seize territory and set up an extremist state in the Sinai.